What are 5 common water heater problems? Problems with temperature: Many people experience issues with their water temperature being too hot or too cold. Aside from temperature issues, some people find that they have no water coming from their heater. Most of the time, this is an indication that the heating element is broken. If you are dealing with a temperature problem, we can adjust the thermostat on the unit. In most households, people are comfortable with temperatures that vary between 120 and 140 degrees Fahrenheit. If water is not making its way from your water tank, we can easily replace your heating element. Issues with noise: Many people experience strange noises coming from their water heater, this can become quite obnoxious. Water heaters that make creaking or banging noises probably have sediment build-up at the bottom of the heater. When this issue occurs, we flush the hot water tank. When the tank is flushed, sediment build-up and debris is removed from the bottom of the heater. Water leaks: A water leak is never a fun experience. The water leak may be a sign that your water heater is overheating. What causes a water leak? The relief valve on your heater could be leaking excess water due to temperature and pressure issues. We can replace the valve on your water heater to ensure that your unit is functioning properly once again. Sometimes the water that leaks from the tank is rusty, which is an indication that there is a hole in your water heater. If this issue occurs the water heater must be replaced immediately. Water with an odour: If you are experiencing an unpleasant odour coming from your water heater, this is a common sign that anaerobic bacteria is present in your heater. Our technique to resolve this issue is to use hydrogen peroxide. We shut the cold-water opening and focus on the opening of the hot water, which will relieve pressure. Once this is done, we will add a few drops of hydrogen peroxide to your water heater and let the water run until the unpleasant odour dissipates. Old age: If you water heater is more than 15 years old and seems to require constant repairs, then the most sensible solution is to have it replaced. 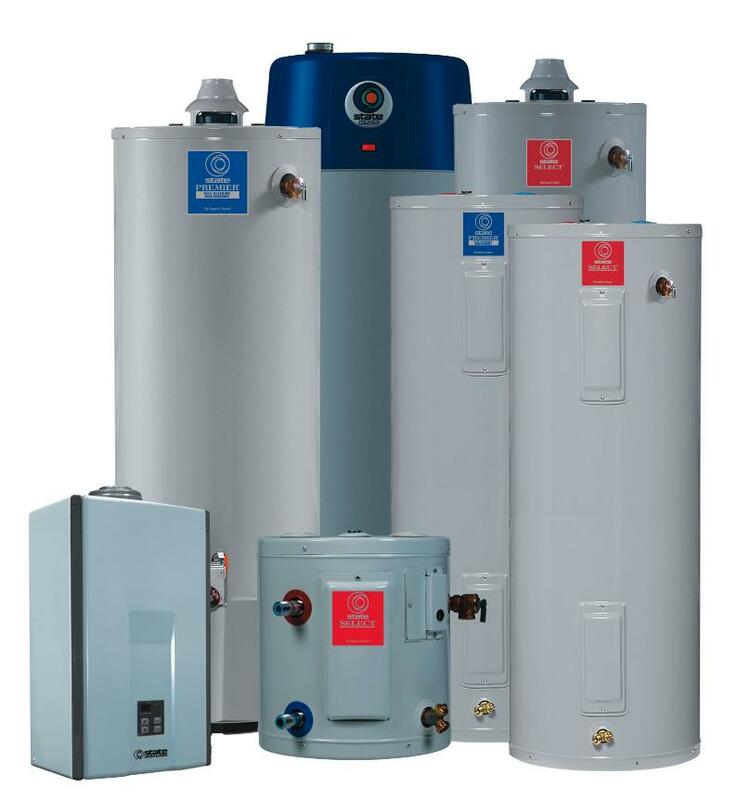 In the long run a water heater replacement will save you money and unnecessary aggravation. Used to be that when a water heater needed replacing, most homeowners just bought a new tank to replace the old one. But now with federal regulations taking effect in April 2015 that require tank water heaters to become more energy efficient, buying a new one just got a little more complicated and possibly more expensive. Although you will save money on your utility bill over time. If you haven't replaced your water heater in a few years, you'll discover that you have more choices than before so it's worth doing your homework. In addition to conventional tank water heaters, tankless water heaters have improved since the days when the "cold water sandwich" left you shivering in the shower. And most tankless water heaters, which only heat the water you draw, already meet efficiency standards. Other choices include hybrid electric/heat-pump models, solar water heaters, and condensing gas water heaters. To comply with new Department of Energy efficiency standards, the water heaters used in most homes won't seem that different and will get a modest boost in efficiency, according to the American Council for an Energy-Efficient Economy. But larger units--those 55 gallons or more--will need to shift to new technologies to achieve the efficiency gains. Doing so can cut utility bills by 25 to 50 percent depending on the technology used. That's good news for homeowners because water heating amounts to nearly 20 percent of a home's energy costs. The new standards apply to gas (50 percent of U.S. households), electric (41 percent), and oil residential tank water heaters. The majority of homes have conventional water heaters that hold 55 gallons of water or less. If you're replacing a water heater of this capacity, the new more energy-efficient model may be an inch or two larger than the old one and can likely be placed in the same location unless it's in a very tight spot such as a closet. For such units, the new standards will increase efficiency by an average of 4 percent. According to the ACEEE, water heaters that comply with the new standards are already on the market, including models from A.O. Smith, Bradford White, and Rheem. Water heaters that hold 55 gallons or more will see bigger efficiency gains. But to attain those gains, the larger water heaters will need to use technologies that are less familiar to consumers including electric heat pumps, which transfer heat from the surrounding air to water, and condensing gas heaters, which capture heat that usually goes up the flue. For homes with electric heat, replacement options include hybrid heat pumps, for the biggest efficiency gains, or two conventional models with capacities of less than 55 gallons each, which won't be as energy efficient. Options for homes with gas heat include a large condensing gas tank water heater or, again, two smaller conventional models. Also known as hybrid water heaters, heat pump water heaters transfer heat from the surrounding air to the water. The ACEEE says that condensing water heaters are designed to reclaim escaping heat by cooling exhaust gases below 140 degrees F, where water vapor in the exhaust condenses into water. 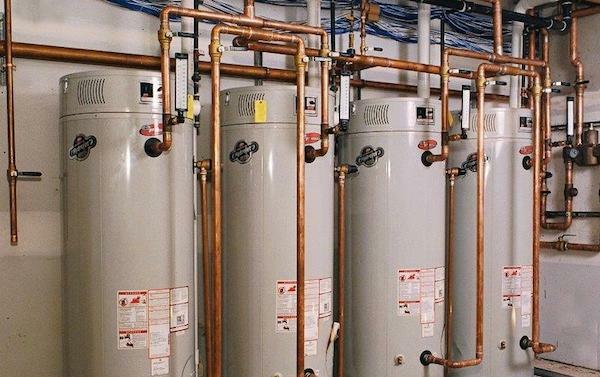 When replacing a large water heater with either of these types, keep in mind that they may require more space. For more information on specific models, check manufacturers' websites. Most water heater makers have been gearing up production for the new regulations. Before you shell out hundreds for a storage-tank heater or thousands for a tankless or solar model, see whether your old water heater can be fixed. A corroded storage-tank model is history. But a leaky drain or pressure-relief valve or a burned-out heating element can often be fixed. Rule of thumb: Consider a repair if the labor cost (which warranties often exclude) averages less than $50 per year over the years left in the warranty. Otherwise, buy a new one, especially if the warranty has expired. Most storage-tank water heaters look alike on the outside. But sawing open a cross-section of gas and electric storage-tank models in Consumer Reports' lab confirmed that paying a little more typically buys a better water heater. Those with longer warranties tended to have larger heating elements, thicker insulation, and thicker or longer corrosion-fighting metal anodes. Longer warranties were also a good indication of better quality for tankless water heaters. But their added complexity can mean more potential problems. Some tankless heater manufacturers shorten the warranty for units used with hard water and in multi-family homes. And most recommend service by a qualified technician once a year. Hybrid heaters meld an electric storage-tank heater with a heat pump that captures warmth from the air. Those we tested provided annual savings of about 60 percent over electric-only models. You'll also save by replacing a broken oil-fired heater with a hybrid. Solar heaters supplement an electric heater with heat from the sun's rays. The best in our tests saved us about 80 percent over an electric storage-tank heater alone during the summer months at our Yonkers, N.Y. headquarters. But those savings plummeted to about 30 percent during cold weather. How much a solar system saves you can vary widely based on where you live, your home's sun exposure, and which system you choose. Most water heaters are sold on the basis of how many gallons they hold. For example, two to four people might use 80 to 85 gallons per day--enough for about three showers, one laundry load, running the dishwasher once, and turning on the faucet nine times. But the first-hour rating (FHR) for storage-tank water heaters and the gallons-per-minute rating (GPM) on tankless water heaters are more important, because they tell you how much hot water the heater can deliver during a set period. A pro can calculate how much you'll need. While almost half of homeowners replace their electric water heaters themselves, it may be wise to consult a professional or at least a manufacturer to fully understand the new regulations and what they mean to your particular installation. You may also need a local building permit. Proper installation and maintenance can optimize a water heater's energy efficiency so it may be best to have a qualified plumbing and heating contractor install your water heater. Kingdom which operates in Canada under the brand name Direct Energy™. Although they bill on the gas bill, they are not in any way affiliated with your gas utility. Do not trust your water heater to Door-to-Door Salesmen Picking the right water heater for your needs requires the expertise of a water heating professional, let M.A.C. Stewart Plumbing help you choose the right tank or tankless water heater. You have a Choice If you are renting from Direct Energy™ there is nothing stopping you from getting a new energy efficient rental water heater from M.A.C. Stewart Plumbing. Canadians use an average of 75L of hot water each at home every day—for washing dishes and clothing, cleaning and personal hygiene. For the average family, that adds up! Water heaters account for 17 percent of the energy consumed in the average Canadian home. That share can vary from 15 to 25 percent depending on the house type, number of inhabitants and their lifestyle habits. Source: Energy Efficiency Trends in Canada 1990-2009, Natural Resources Canada. Canadians can choose from various types of water heaters—storage tank, tankless , combination , solar, and heat pumps and different energy sources , e.g., oil, gas, propane, electricity or the sun. installing a drain water heat recovery (DWHR) device to reduce your water heating load. An energy-using product’s first price tag—the sticker price—is obvious. Smart consumers also consider the “second price tag”: the cost of operating the product over its lifetime. For example, take an electric storage water heater that costs $700 to purchase and install. If electricity costs 10 cents per kilowatt-hour (kWh) and your family uses 225 litres (L) (50 Canadian gallons / 60 U.S. gallons) of hot water per day over a 10-year period, your energy costs will be about seven times the cost of the equipment. Gas- and oil-fired water heaters (storage tank and tankless) are rated for energy efficiency using a measure called the energy factor (EF). The higher the EF, the higher the efficiency. Electric water heaters are rated in terms of standby loss measured in watts. The lower the standby loss, the higher the efficiency. There is also a performance measure called First-Hour Rating (FHR) for storage, condensing and heat pump water heaters. For tankless water heaters, the rating used is Litres per minute (LPM).